We offer you the chance to view our auction collection twice. Take advantage of this, it is the best preparation. We advise you to come and see the horses from our collection with your own eyes. This gives the best picture. Gertjan van Olst will give detailed information about each horse personally. You are very welcome to visit our company at Terheijdensspoor 9 in Den Hout on Wednesday 17 and Friday 19 April. Until then! The auction will take place on Friday April 19th 2019. More than 30 talented dressage horses will go under the hammer. The auction starts at 7:30 PM and is free for spectators. Are you interested in a VIP arrangement? Then click here. Do you have questions about the collection? Then contact us. The auction will take place on Friday April 19th 2019. 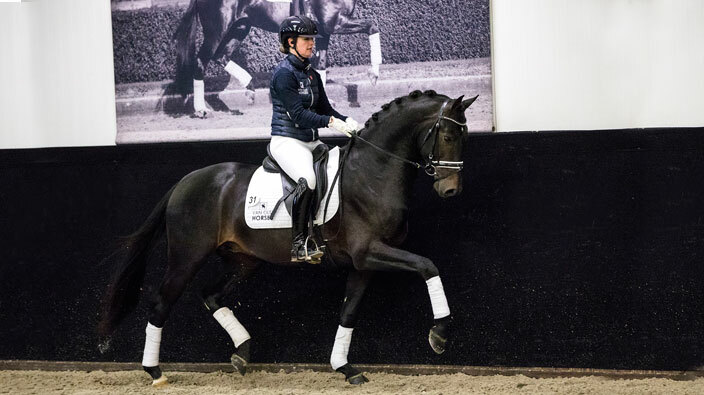 More than 20 talented dressage horses will go under the hammer. How long does it take before the auction starts?